Redbay are proud to announce the delivery of the latest 950 Sea Safari RIB to a new customer, Mr Richard Stevens of Jersey Seafari’s. 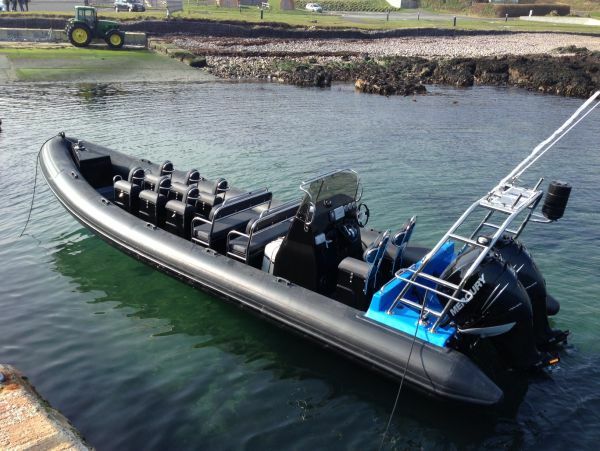 Richard has made the Stormforce 950 his vessel of choice for his growing sea safari business. He already operates one vessel on the idyllic island of Jersey in the Channel Islands and this latest boat will increase his capacity and ability to offer longer and more demanding trips. The boat is rigged with 2 x Verado 300 Hp outboards which give it an eye watering top speed of 60 knots and it is sure to whet the appetite of the many thrill seeking individulas who visit the channel islands annually. The boat is configured with 6 x jockey seats forward and 2 x bench setas aft, a stern mounted console and the usual plethora of MCA related safety gear. The electric blue colour sheme is a new and striking addition to the TEAM REDBAY offering and one I am sure that we will see again.